Cable Tester: 1.Test RJ11/RJ12/RJ45 cables. 2.Test correspondingly double-twisted cables 1, 2, 3, 4, 5, 6, 7, 8 and Ground. 3.Can judge wrong connection, short circuit and open circuit. 4.Put cables into both main tester and remote tester. 5.The lights of the main tester will turn on sequentially from 1 to G. 6.Detachable remote tester, test remote cable up to 1000ft. in length. 7.Power supply: 2 pcs AAA batteries (not included). 8.Come with protective leather case. 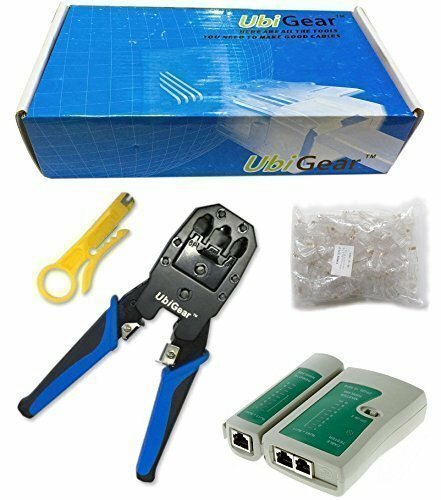 1 x UbiGear Network Crimper 315 -- works for RJ11 (6P4C)/RJ12 (6P6C)/RJ45 (8P8C) connectors. 1 x UbiGear Cable Tester for cables with RJ45/RJ11/RJ12 Connector. Power supply: 2 pcs AAA batteries (not included). The LED lights will flash in rotation if all the wires are properly connected, otherwise the corresponding light will not flash. UbiGear One-Year Limited Warranty with 100% Satisfaction Guarantee! If there is anything wrong with your order, just let us know, and we'll take care of it.